Sagia practices in her bedroom. The straight-A student possesses a combo of unique natural ability and a strong work ethic with her music. Sagia discusses her life as a young jazz musician. She loves the genre's nuances and complexity. Buena High sophomore Isabella Sagia, 14, attends the Tucson Jazz Institute to further her musical instruction and aspirations. When Isabella Sagia came home from elementary school one day and announced that she wanted to play the saxophone, her mother was a bit incredulous. Although most 10-year-olds would likely find it discouraging to begin their musical education with such a difficult instrument, the now-14-year-old Sagia stuck with it — and excelled. While Sagia knows many kids her age aren’t into jazz, she says the genre’s complexity and nuances hold a special appeal for her. Keeping up with a demanding schedule of band practices and performances has not come without sacrifices for Sagia, who plays with the Buena marching band as well as the award-winning Tucson Jazz Institute. She has managed to maintain her straight-A average by doing her homework in the car on the long drives to Tucson for practice, she said. Freeman said that while she sometimes worries about whether her daughter takes on too much, it’s what she wants to do. “She is the most dedicated person I know,” said Freeman. “I’ve never seen someone so passionate about one thing, especially so young at 14. Sagia’s ensemble ended up placing third out of 15 finalists that performed. Following the competition, the band had another exciting experience: They recorded a CD with Grammy-winning vocalist Dennis Rowland in June. It will be released this winter. 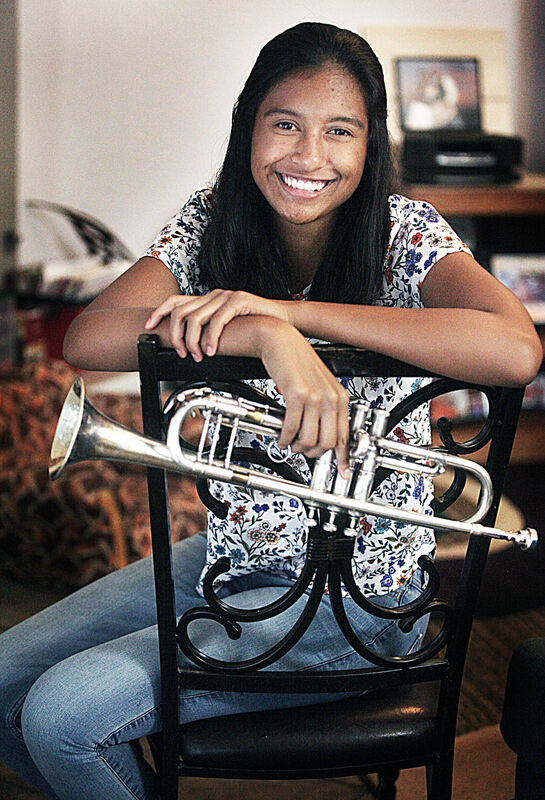 Sagia shows a natural affinity for music in addition to the long hours she puts in practicing, and has the rare gift of perfect pitch, her mother said. Not a musician herself, Freeman wasn’t aware of the extent of her the teen’s gift until Sagia’s instructors told her. While Sagia doesn’t plan to pursue music as an adult, Freeman is proud of her no matter what she decides to do in the future, she said. For the time being, Sagia plans to continue on with both the Buena marching band and the jazz institute while navigating high school. Regardless of what career path she chooses, music will always be a part of her life, she said.